This project is from an assignment where we were supposed to create a boss battle using Unity to test our scripting abilities. This project was made after just a few weeks of unity experience. I made all graphics myself to have more control and to keep an even artstyle. 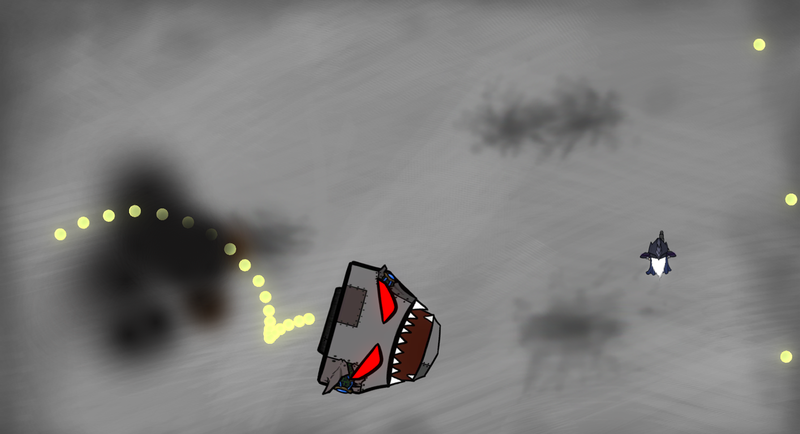 I wanted to have several phases of the boss and make the player have to figure out what to do in each of them. Feedback on player actions is something that I tried to improve with this project. In this game you shoot in the direction you’re facing, but has the ability to strafe. This is an important mechanic that lets you dodge and shoot the boss at the same time. The character can walk in eight directions and lock rotation by holding space at any point. He comes equipped with both a blaster and a shotgun. The blaster that is great at long range and can be spammed at all times to get some hits in while you are dodging. The shotgun rewards the players who uses timing and good positioning. In this phase the boss shoots bullets with a wide spread so that the player had to find the gaps and position themselves accordingly. This was quite easy though, so I made the boss shoot two single shots whilst the spread travels past you. Because of this you cannot stand still in an opening since you also have to move to dodge the single shots. The boss’ weak point in this phase are the eyes. When both of them are destroyed the boss enters phase 2. When transitioning to the second phase the boss’ eyes turn red and it raises its shield. It now starts sending out homing sawblades. The player cannot hurt the boss but they can destroy the sawblades chasing them. To deal with the boss in this phase you’ll have to lure the sawblades towards the exposed wiring on its back to cut them off. When the boss’ cables are cut, it summons turrets in all four corners. 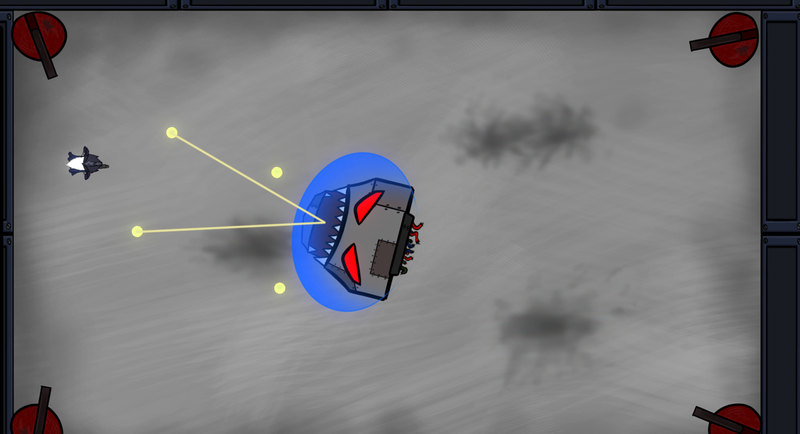 The turrets shoot bullets with a couple of seconds in between. They don’t move super fast, but coming from different directions makes it trickier. The boss shoots dual shots to the players sides. The player can stand still and not be harmed. But if the player is strafing they will get hit. This is to make the player think about their positioning instead of mindlessly strafing around the arena. 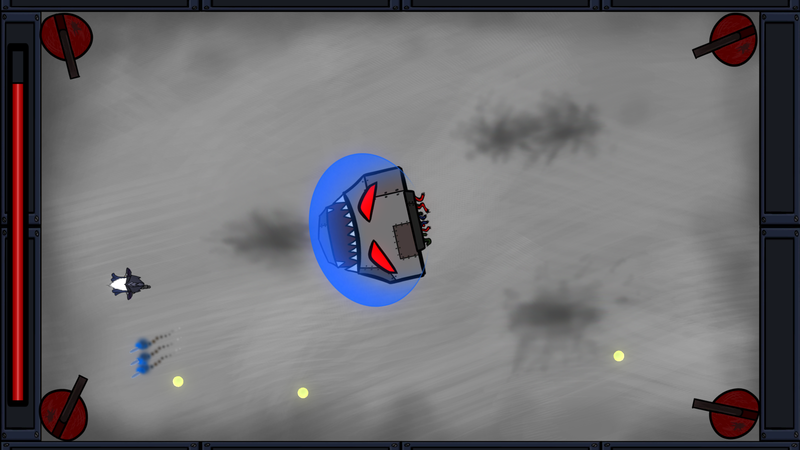 The four turrets stops the player from standing still at all times. To break the pattern, the boss shoots a barrage of missiles after every third dual-shot. You must stop for the dual shot but then be ready to move from the missile barrage. To complete the phase you must destroy the turrets. You bullets will do nothing though, so you must lure the boss to shoot rockets at them. The player have to rotate around the arena while stopping and moving at the right time. 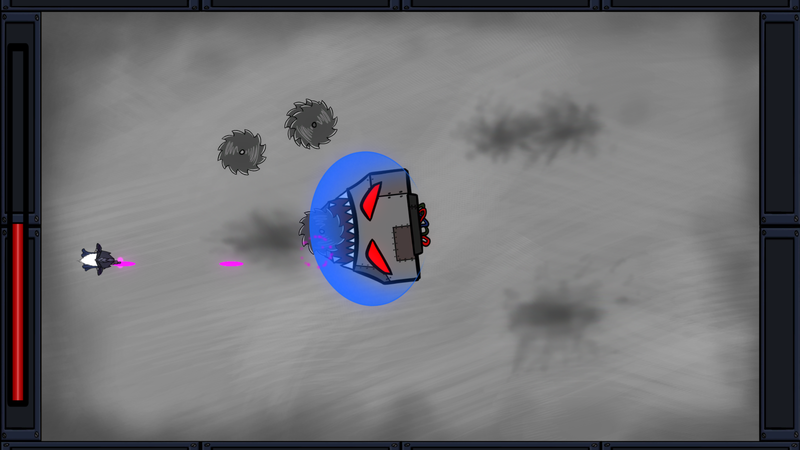 When the turrets are destroyed, the boss cannot keep its shield up anymore and its generators are exposed. 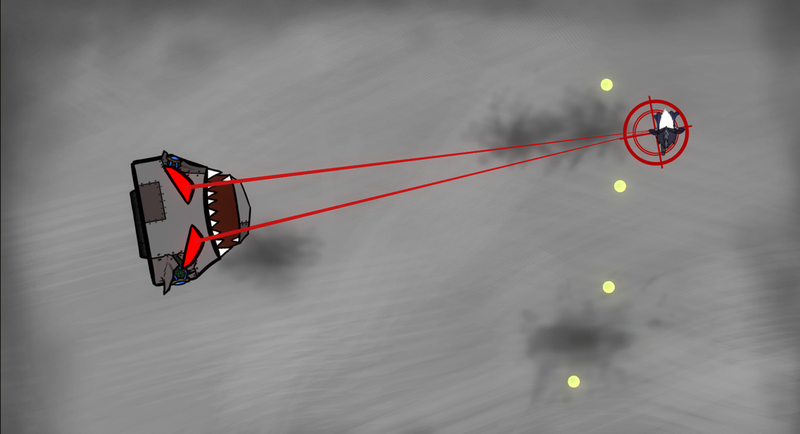 The boss shoots projectiles in a cone and uses its targeting gaze on the player. After a couple of seconds the boss locks the gaze briefly before charging at that position. 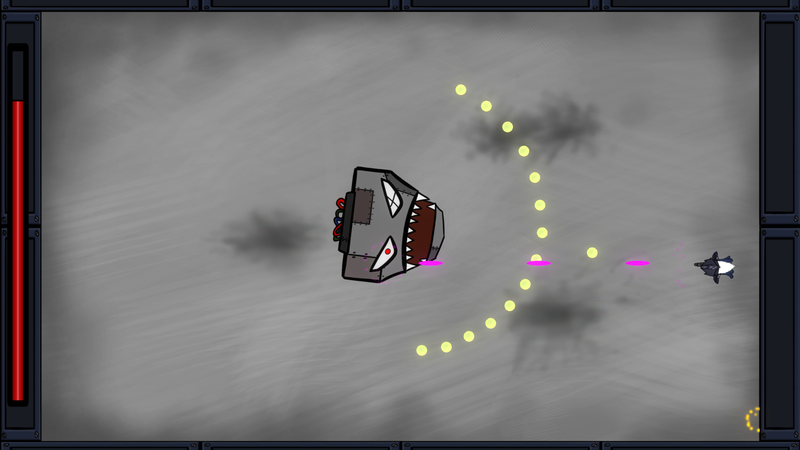 While charging, the boss also releases a swirl of projectiles. The player should keep their distance to have an easier time dodging the projectiles. To finally kill the boss, the player has to destroy the exposed generators at its side. The player has to turn and use the strafe mechanic. I made use of the 2D and piled the eyes on top of each other and just enabled mesh/destroyed eyes when i needed to. In the second phase you need to destroy the wires on its back. This being my first playable experience I made with Unity I must say I am fairly satisfied with the outcome. I had fun both designing the different phases and making them come alive via scripting. While graphics was not a priority I siezed the opportunity and made my own to get some drawing into the schedule. Though I am nowhere near an artist I still enjoy it a lot. Part of me wishes that I would have settled with fewer phases to have the others more polished but I learned a lot from making each phase and I got to push myself to get it all together.